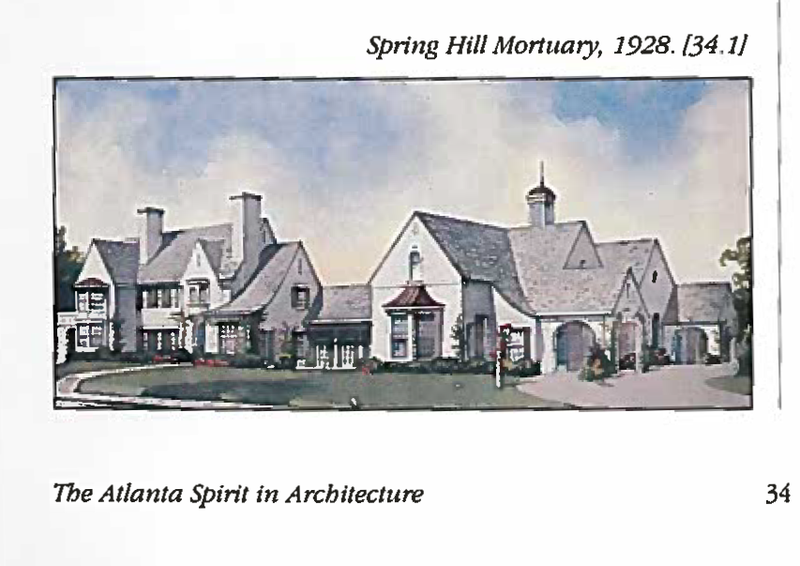 1928 Spring Hill Mortuary illustration from The Spirit of Atlanta. The Atlanta Preservation Center has formally requested landmark designation for the Spring Hill Complex from the Atlanta Urban Design Commission. The Spring Hill Complex is an extraordinary work of architecture by one of our greatest 20th Century masters, the architect Philip Trammel Shutze. The building has an exceptional place in Atlanta’s cultural history, is a landmark in the truest traditional sense, and is placed within a garden setting, which is also worthy of recognition. The building was designed in 1927-28 and was built by the Bowen Construction Company. Due to the growing development pressures in midtown Atlanta, it is essential that the greatest measure of protection possible be given to this historically significant complex. This element of protection needs to be put in place as quickly as possible. This action will not only serve to protect one of Atlanta’s most recognizable historic buildings, but will also serve to encourage any proper and appropriate redevelopment of the property, which might become necessary. It will allow the transfer of development rights, as well as aiding in the significant tax advantages which should be available to an historic property of this caliber.